- You’ll find Easy City Downs along the eastern shoreline of the Commonwealth, just north of Boston Airport. You’ll know you’ve reached the right place almost immediately, as some dude will start announcing race results over a loudspeaker. Yep. 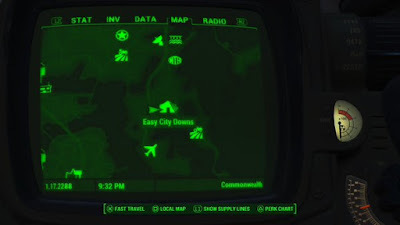 - Easy City Downs isn’t quite so friendly as it seems at first. There are Mines in the parking lot and on the outskirts of the track, and if you try to get onto the track the Raiders will open fire on you. Unfriendly - and you have two broad ways of dealing with them. … because once you move past the track and into the middle of Easy City Downs, the announcer will sic the robots on the track on you. Most of them are relatively simple-to-kill Mr. Handy units, but there’s an Assaultron mixed in that can do some significant damage if you fight it alongside a cluster of other enemies. You’ll also start getting pegged by some Triggermen from the stands. Again, draw them away from the track and try to split them up so they can’t engage you in larger groups. There are lots of cars around that you can use to divide and conquer. Once that’s done, sweep through the clubhouse beside the track to wipe up the remaining baddies. In this case you’ll be sneaking into Easy City Downs via the clubhouse beside the track. There are doors on the north and west sides of the clubhouse that you can use to get inside - just watch out for tin can traps that will announce your presence. Move quietly through the stands and the clubhouse and wipe people out as you go. If you have a silenced weapon you may be able to do this without alerting either the announcer or the people in the middle of the track. You’ll still have to wreak havoc on the Raiders, but the stands give you an easier place to snipe from. If you want an alternate stealth route that’s much funnier, and are a Master-level hacker, look below. - Regardless of your approach, you’ll likely still have one guy to kill: Eager Ernie, the announcer. He’s on the second floor of the clubhouse, which is inaccessible from the ground floor. To get there you need to climb up onto the towers in the middle of the track and use the bridges to walk across to his room. Ernie himself is no big deal, and he has two neat items on his body: Eager Ernie’s Key and Eager Ernie’s Password. If you’re rescuing someone who was kidnapped, they’ll be sitting in Ernie’s room. Woot. Beside them is a trunk with a bunch of cool stuff inside. You can also find a Tumblers Today magazine in Ernie’s room, on a table near the lantern. There’s a terminal in Ernie’s room that you can access with his Password, assuming you can’t hack through. This computer controls the robots, and can change their behaviours, whom they will target, how many are active (yay, three more! ), and trigger a self-destruct. The robots aren’t great at following you off of the track, so there may be plenty still running around if they didn’t become hostile, or if you weren’t thorough. Do as you will with ‘em. Did you enjoy listening to the bugle playing constantly? It’s thanks to a floating robot called Ol’ Rusty, and it’s carrying a holotape called The Bugle Repertoire. Now you can listen to it everywhere you go! There is a safe on the same floor as eager ernie. That is what you will need the key for. It's on the second floor, on the west side of the building, behind a half wall. Didn't see this tid-bit in your post, but I think it would help. Other than that, it's very informative. Very helpful I love this page!